Living on the edge of a forest with a view of the ocean allows one a different perspective from a life lived in even a small city. You might think that’s obvious but what would you expect to be different? I live in what I refer to as a fishbowl. My house is elliptical and I am surrounded by glass. I have no curtains and my tiny house overlooks the Pacific Ocean through a whanau/family of magnificent and ancient Pohutokawa (Metrosideros excelsa) trees. 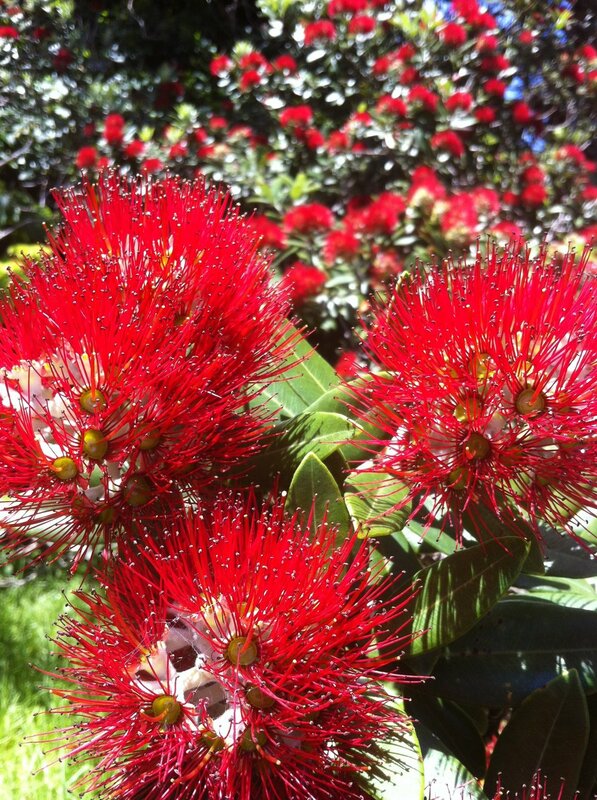 They flower in early Summer and are popularly known as the NZ Christmas Tree. I am frequently woken by the calls of Korimako/Bellbirds in the bush outside my window. The Finches and Sparrows often try to get through the mirrored glass. The Korimako is looking for food and talks as she does so. She is so melodious and I can’t help but smile. If any bird can be called ordinary then this ordinary-looking and shy creature has the voice of an angel. If it’s not these birds in my Luculia then it’s the Tuis who sing at dawn. It’s an equally beautiful song and sometimes difficult to distinguish from the Korimako. The Tui though is a regal-looking bird; much bigger and much more socially outgoing. Being here at Motuaruhe, away from the towns, and, as it were, in the very midst of nature, I have become so much more aware of the world around me. I notice when the Piwakawaka/Fantails disappear to the hills and when the Silver-eye or Wax-eyes come down to feed on the bananas or amongst the Hibiscus, when the Kereru/Native Pigeon are mating and when the Kotare/Kingfisher is back in action with its persistent delight with Summer weather. In Autumn I am visited by a pair of Paradise Shelducks who rest in the Pohotukawa, making their extraordinary calls, often sitting close together on the same branch. Even in flight, they like you to know they're around. They stay a week or a bit longer and then leave. The Karearea/Native Falcon isn’t always noisy: its flight is so graceful and purposeful. He stays for a few days and then moves on. He, or perhaps she, will be back. Down in the Bay, I'm trying to learn the names of the different Gulls. If I'm lucky there are a pair of black Oyster Catchers with their bright red beaks and legs. These birds, reluctant to “wing it”, make a distinctive sound that matches the comical walk that quickly becomes a run. There’s usually a Heron strutting about in the shallows who taunts my wee dog. Kuskus can’t believe the bird is still there as she gets closer and closer, the heron leaving it until the last moment before takeoff. Today, for the first time I saw a Reef Heron and last week saw a small Stingray as it gracefully moved through the shallow waters. Orcas are known to visit the Bay although I’ve never been lucky enough to see one. Penguins live under one of the baches/holiday homes close to the sea and though I’ve seen them on the water I’ve never seen one onshore. It’s not just the birdlife or the trees whose cycles I notice. The cycles of the sun and moon change with the seasons. I am often sitting with a glass of wine watching spectacular Autumn sunsets, and at this time of year, the sun settles into the ocean. All Summer, I’ll have watched sun falling behind the hills that frame my ocean view. In Winter, the sun’s low traverse of the sky heats my mud/concrete floor and, if I get up at night, the floor is still sun-warm. This doesn’t happen in Summer when the sun is higher in the sky. In Summer, if I get up at night, I often step outdoors to admire the heavens. There’s a little coolness in the air and the stars are so bright and multitudinous that one can’t help but feel awed. At full moon, my entire house lights up (as it does when there's lightning) and in good weather, the lightness persists until the moon's shape has changed or it has departed our hemisphere either very early, or very late. Living in the city, we often don’t notice these things. From my bed, the other window allows me a framed view of the changing heavens; the shifting of constellations and, if I wake early, I can usually tell the time by the whereabouts of the morning star. The blessings of living close to my natural environment are far too many to document here. Suffice to say that I love my world and it is a constant reminder of how much, when we are removed from it, we abuse it. Living in Nature’s embrace allows us a sense of peace and a quiet sense of oneness. That feeling may not last long but it is worth remembering that it is within reach wherever we live. If you live in a city, then you may have to make more effort to remember the importance of holy-days; time to allow our spirit to rest and let Nature rejuvenate and refresh one’s well-being.